Grand Rapids Gas Light Co., established in 1857, was an early underground utility, originally providing gas for streetlights on Canal Street, its mains and pipes branched out into the city from the plant, generally known as the Gas Works, located at the corner of Wealthy and Oakland. Primitive wooden sewer systems were in place very early, but the first brick sewer was laid down in Monroe St. in 1856. 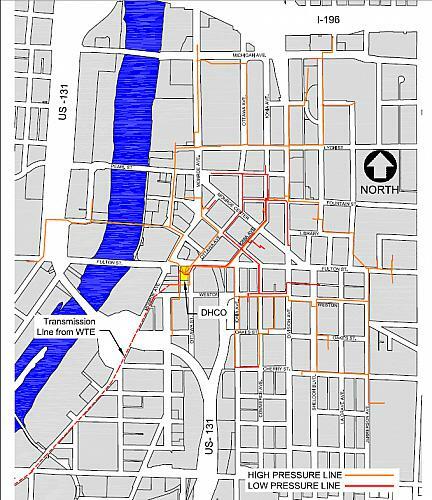 The Grand Rapids Hydraulic Co. began laying underground water pipes in streets and alleys during the summer of 1855. Near the end of the 19th century 118 miles of water mains and 1109 fire hydrants had been installed at a total cost of $1,276,576. Supplying water to the city through an underground system evolved over several decades, but in 1886 William R. Coats, under contract with the Board of Public Works, laid a cast-iron water main 600 feet long and sixteen inches in diameter across the Grand River near the pumping station at Coldbrook Ave. It was put together on stagings erected for the purpose and lowered bodily into a trench excavated in the rock at the bottom of the river. It was considered a remarkable feat of engineering at the time. One of the least known underground systems are areaways, often thought to be parts of tunnels. These mysterious, spooky and often sealed-off subterranean spaces rarely connect unrelated buildings and never extend into the street beyond the sidewalk. Sometimes they are purported to be underground railroad tunnels for escaped slaves. This is not true, as they were built after the Civil War. Under the sidewalks of downtown were miles of areaways. Many of these were used for the storage of boxes and bales of merchandise, while some were used for business purposes. James J. Baylis owned the cigar stand in the Morton Hotel. 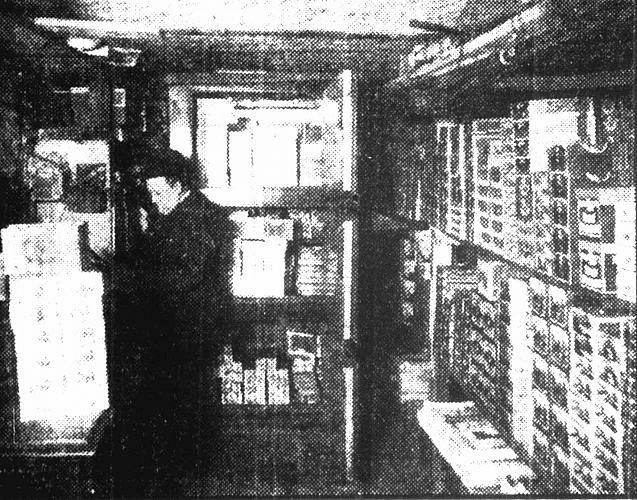 His storeroom, typical of those beneath the sidewalks of Monroe Street, was under the front entrance of the Morton. In it were stored many hundreds of dollars worth of cigars, domestic and imported. By an ingenious arrangement, invented by Baylis, the room was thoroughly ventilated to overcome the dampness natural to a cellar. Under the main entrance to the Pantlind Hotel a barbershop provided shaves and haircuts while the customer listened to the patter of feet on the overhead sidewalk. Citizens Telephone Company was located on Louis St. between Campau and the Grand River. Few people knew that a tunnel, built by the Citizens Company in 1902, ran beneath the center of Louis St. in the block where Citizens was located. 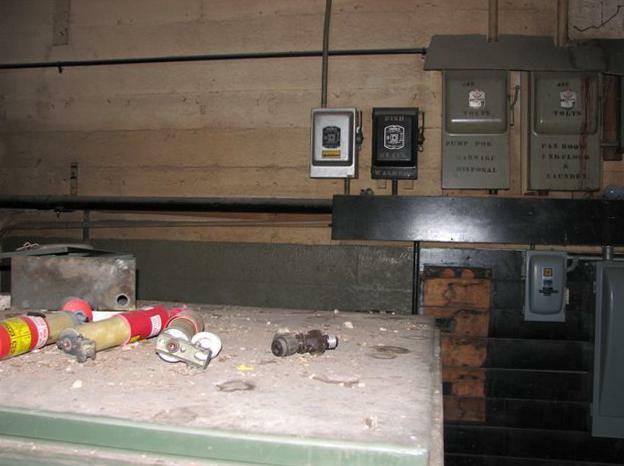 It housed large cables that were supported on the walls. The tunnel was six feet tall and wide enough for two people to walk abreast. The largest of the early tunnels was beneath the Union Station at the corner of Ionia and Oakes. It was about four hundred and fifty feet in length and about five feet in height. Through it extended the steam pipes that were a part of the building's heating system and the wires that carried electricity for lighting purposes. 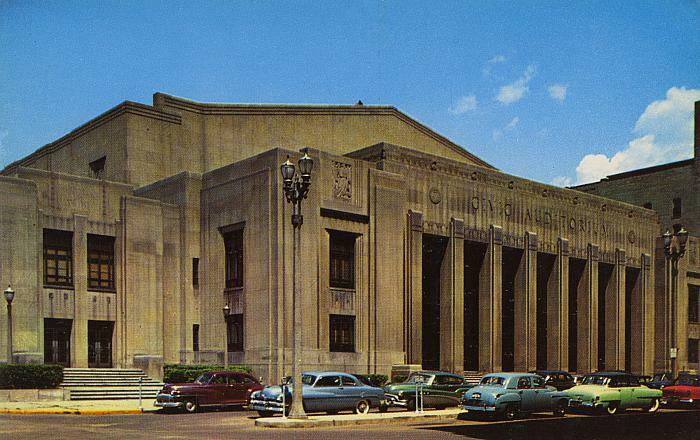 Early tunnels were not for pedestrian use, but many may remember the tunnel that connected the [Welsh] Civic Auditorium with the Pantlind Hotel. 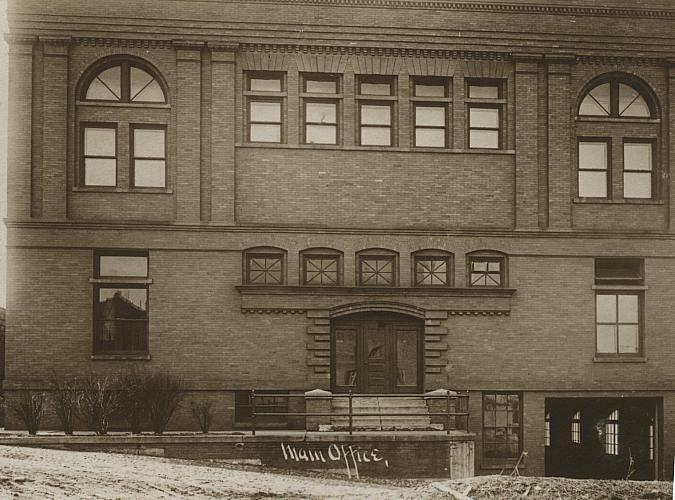 It allowed food service to be taken from the Pantlind's kitchen to the auditorium for conference or convention banquets as well as providing easy access to the hall by hotel guests, especially during inclement weather. Work on the Auditorium began in June of 1931; the tunnel was in use by the fall of 1932. In 1897 the Edison Electric Company began laying mains in the streets and alleys of the city to furnish steam heat to business places. 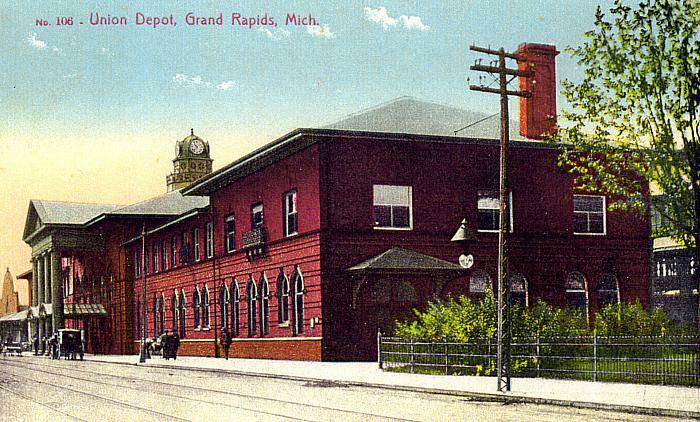 One line ran south from the Edison Plant to the railway train shed and then west, through the train shed to the new Grand Rapids & Indiana freight house. A main was laid for the purpose of heating all the railway buildings and also the coaches of the outgoing trains. A line was also laid from the railway system across Ionia St. to the Kent Hotel. Steam was turned on October 15, 1897. 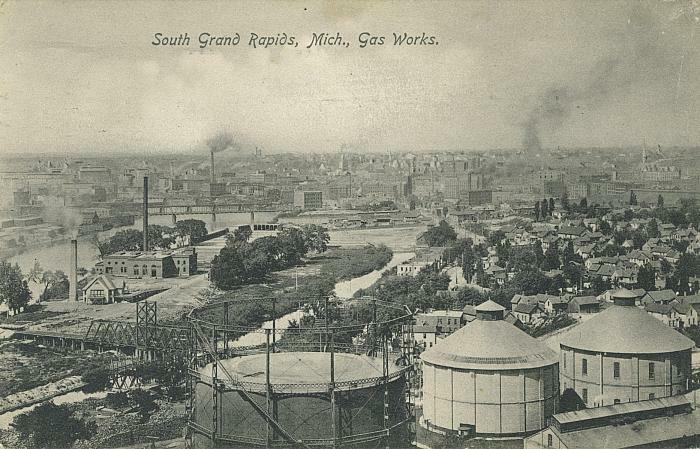 The underground steam system has been in continuous use in Grand Rapids since the original system began in 1897. 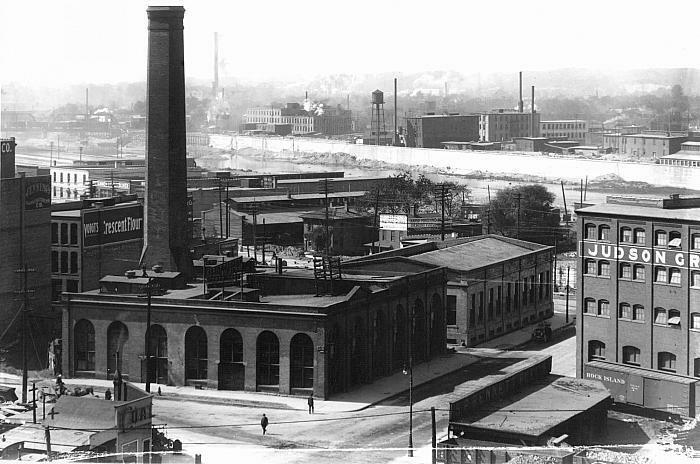 Of course, none of the original underground pipes are still in use, but the steam plant occupies the same site at the SE corner of Fulton and Market that it did in 1897. St. Mary's Hospital is the largest single customer, and the City of Grand Rapids is the largest customer with approximately 15 buildings on the system. One line crosses the river to service the Public Museum and Grand Valley State University. Bitter winter cold bedeviled Grand Rapids water workers, at great expense to customers. Underground River: Fact or Myth? Baker, Robert H. The City of Grand Rapids: Sketches of Principal Industries and Business Houses. B.F. Conrad & Co., 1889. Goss, Dwight. 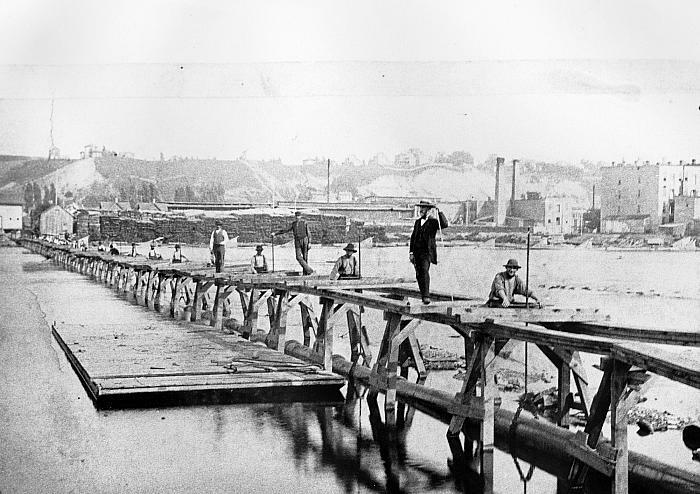 History of Grand Rapids and its Industries. Chicago: C.F. Cooper, 1906.